What happens when you get six bright young people in one room, arm them with a ball of string, and ask them to find a way to visualise data connections? The answer: a creative and innovative solution. At Generation Innovation, that’s exactly what we did and the result was extraordinary. 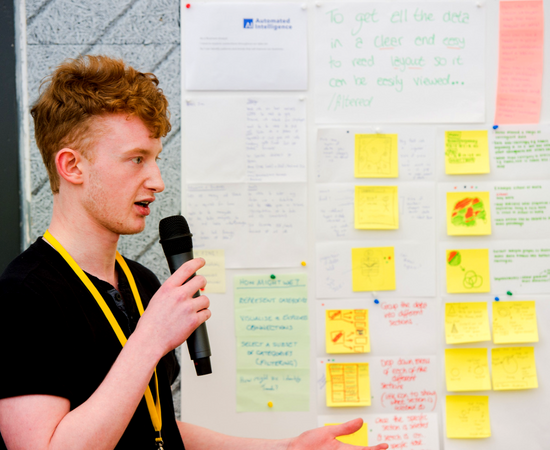 Generation Innovation is a new approach to work experience, pairing young people with innovative companies in Northern Ireland’s tech sphere. When we heard about this chance to work with the future movers and shakers of technology, we knew we couldn’t miss out. From the beginning, we looked at Generation Innovation as an opportunity. We worked together to create a challenge that actually affects us as a company; namely, visualising data connections in a human and informative way. Visualising data connections is no mean feat. And with businesses more and more eager to gain new, real-time insights from their data to inform important business decisions, we need to ensure that we deliver this capability in our software. A key to our approach was employing Design Thinking. This is a way of resourcefully approaching problem solving that plays to the strengths of every person in a team. Design Thinking means believing that, when given the opportunity to be visionary, people will shine. So, armed with the ball of string mentioned above, some sticky notes and a lot of initiative, in less than 12 hours, six previous strangers had worked together to solve our problem. This solution was then presented to our senior management team. The results were so impressive that we are seriously considering looking into the solution in more depth. Generation Innovation was the perfect fit for our company. 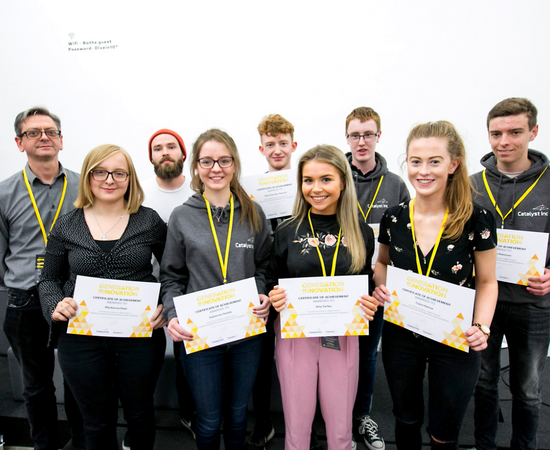 Working with and challenging the young people who will go on to innovate in the tech industry was also hugely rewarding for everyone involved. We can’t wait to see what the future holds for our team.